My packed lunch adventures and experiments. Be very afraid! Looks aren't everything, but it sure helps! Yesterday, I had great leftovers to work with, so I knew my bento was going to be tasty. I didn't have a lot of time to put it together, but I decided to put some effort into making my box look good. Tasty isn't enough! Grain: It's just a plain bulgur with cumin, salt and pepper. Curry: This is a curry I made with left over masala sauce (from indian take out, shamefully) that I mixed with a little broth. I chopped carrots, cook them up with shallot, and kale, added a can of lentils, and dumped the curry sauce in. I had it as is for dinner. Before putting it in the bento, I added some of that onion chutney they send along with samosas, it's red and super spicy. It gave it a whole new delicious taste. Side: I have roasted vegetables (salt, pepper, paprika, coriander, a little cumin) left overs from Monday night. After putting them in, I added minced orange zest for the look of it, but it also did wonder for the taste. Delicious! Dessert: I have pieces of navel oranges. They are in season and I'm absolutely obsessed! I eat 10 lbs/week. Help! So delicious! 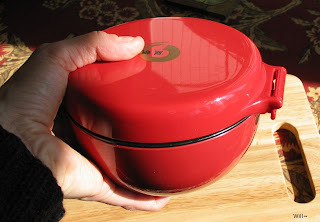 The box I'm using is a "donburi" box, made to have the "yummies" up top and the grains in the bottom tier. that way you can carry the two separately, and mix them up just when it's time to eat. 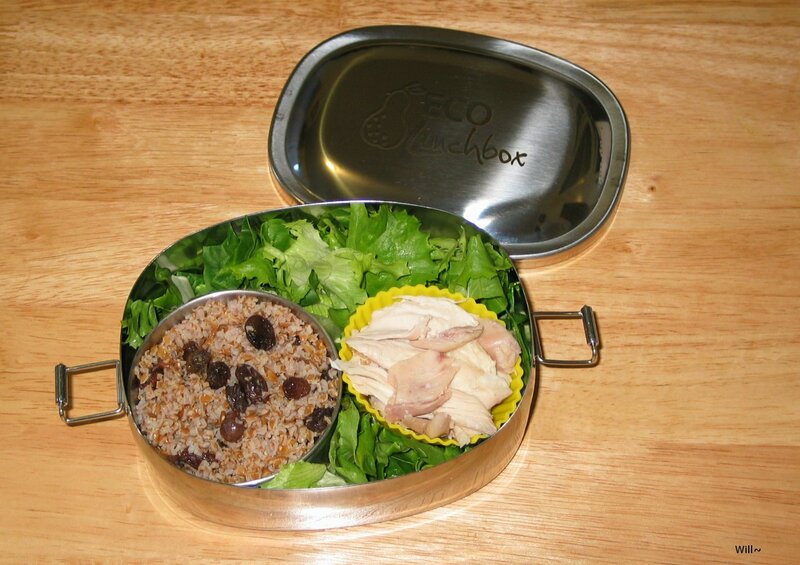 I'm using it differently because I tend to eat less grains, and have several dishes in each bento. I'm in a phase where I want to have less boxes, but better quality ones. I'm tired of cheap plastic and little monkeys, I want my box to be a little less "cutsy" and more elegant if that make sense. I'm not saying there won't be colored shaped eggs anymore, or flower-shaped carrots, the cutsy curse will never really die ;o) Just not the mood I am in these days. With that in mind, I have started looking at lacquered wooden boxes. They are very pricey, but so beautiful and durable. Of course the one I'm totally drooling over is way out of my price range, but it's absolutely gorgeous. I keep looking at it and telling myself over and over "you can't pay that much for a lunch box, it's ridiculous!" I might convince myself, riiiiiight! 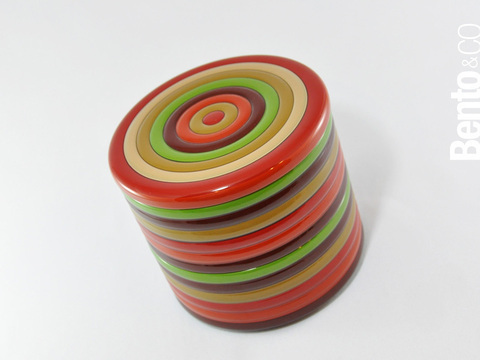 It's actually a 2 tiers box, the tiers stack up and there's a lid to top it all. 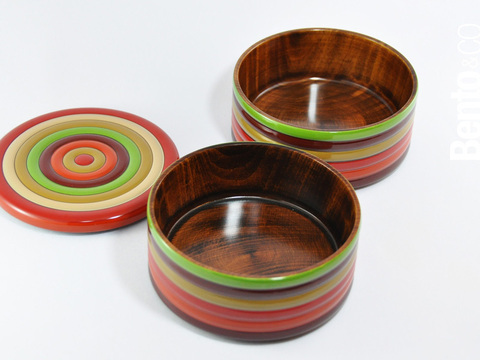 Each part is made of a solid piece of wood, no seams at all. It's been over a year! Knock, knock! Anybody still looking in here? I have been so busy during the last year that not only bento-making, but even cooking took the back seat. Since January, I've slowly started getting back into my good old habits of actually cooking food, preparing ahead, and making a bento every once in a while. Most of them were very rudimentary, certainly not worth a picture or a blog post. A few weeks ago, I had an activity with my members at work about packed lunches (I work for Weight Watchers) and I asked them to bring in lunch to show off. That week I decided to bring in bento boxes to show them how neat it can be. I caught the bug all over again. How could I have forgotten how fun this is?? I don't prepare a bento every day because I don't always eat lunch at work. Very often I come back home to eat. Most of the time when I do eat lunch out I bring my bentos now though! I put down a bed of lettuce and spinach, in the yellow silicone container, I have some leftover roasted chicken (from Safeway!). In the stainless container, I have bulgur with cumin and raisins. It was very filling and actually pretty darned good! In this bento, I have a mix of bulgur, pinto beans and chopped carrots and onions in the insulated tier (top center). I also have chopped celery and red onion topped with chopped cherry tomatoes (left front) and plain chopped carrots (right front). It was all bright and colorful, as well as filling and tasty! I know it's weird to have plain raw carrots in a bento, but I like the crunchiness. If I have nothing to crunch into, it's not a real lunch! On the right, I have spaghetti squash leftover with Spicy Barley Pilaf leftover! On the left I have roasted chicken leftover... and strawberries! I was wondering how to two sides would go together since they were leftovers from different meals, but it was just delicious! This is from the following day, leftovers again! 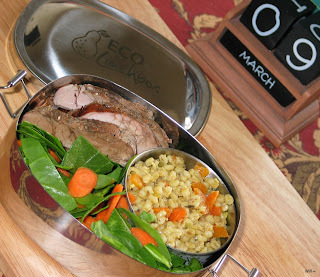 Here I have Peppercorn pork tenderloin with Spicy Barley Pilaf and a spinach - carrots salad. I'm not yet up to the cutsy curse attack, but I think this bento is esthetically pleasing. I love the contrast between the orange of the carrots and the bright green baby spinach. It ties in well with the little bits of carrots in the barley pilaf. The peppercorn tenderloin was pre-marinated. It's the easiest thing to put together and the taste is very strong. It could be over-powering, but for a bento it's perfect since a little bit goes a long way. Ok, this is what you call a desperation bento! I had about 1/4 cup of cooked red quinoa in the fridge, and a few veggies. I chopped carrots, cucumber and red onion very finely, 1/2 apple chopped even more finely, 1 slice of black forest ham, and mixed it all up with the quinoa. I added salt, pepper and a little bit of lemon juice. Et voila! It turned out to look very pretty and you know what's even better? It was delicious! 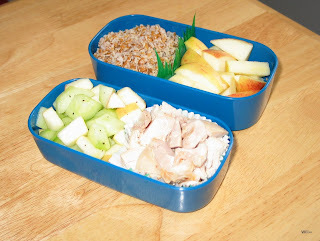 Finally, another fairly simple (and sorta lame if you ask me) bento. Roasted chicken (I know, again, but it's easy for bentos...) with cup up apple and cucumber (lower tier) and simple bulgur with chopped apple (top tier). I don't even remember eating this bento. It was rather boring, both in looks and in composition. I shall do better from now on! So there you have it, the boxes that I bothered take pictures of recently. I am hoping to have more time for pictures from now on since my schedule is slowly getting a little more sane. Check back with me for more bento adventures!!!!! The Lifestyle blog and the attached sub-blogs are not in any way linked to my employment at Weight Watchers. They reflect my own opinions and views not Weight Watcher's.